Supermarine Spitfire Mark IXBs of No 453 Squadron RAAF on the ground at Ford, Sussex. 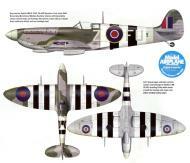 Supermarine Spitfire Mark IX, 'FU-V', of No. 453 Squadron RAAF preparing to taxy at Ford, Sussex, for a sortie over Normandy. The aircraft carries a 44-gallon long-range fuel tank under the fuselage to enable it to extend its operational radius on the continent. Supermarine Spitfire Mark IXs of No. 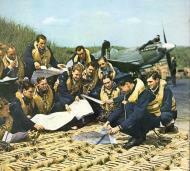 453 Squadron RAAF, are started up at Ford, Sussex for a sortie over Normandy. Both aircraft are carrying 44-gallon long-range fuel tanks under the fuselage to extend the their range over the continent. Behind them can be seen a De Havilland Mosquito NF Mark XVII of No. 456 Squadron RAAF, also based at Ford in order to provide night defence over southern England.